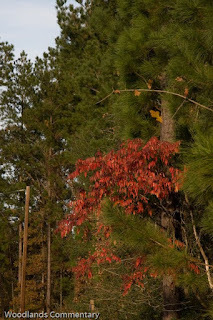 The Woodlands Commentary: A New Woodlands? The Woodlands is still under development and will be for some time to come. However, the idea behind The Woodlands is getting stale and outdated. Montgomery County has been growing by leaps and bounds but not from a master plan. Conroe has identified an issue in master planning and taken the bull by the horns through a zoning regulation proposal. Hopefully, their zoning ordinance for tree preservation and livability restrictions will pass. In a discussion about the future of the county with Judge Sadler, I came to the conclusion that he is onto something significant and in the right direction. That is, he has identified an area in west county that could be another future "Woodlands". We need to be thinking forward 25 years from now. How could such a vision be realistic? There would be many hurdles to overcome! Let's begin answering how such a vision could unfold by defining the issue. Expansion of housing and businesses in our county has traditionally been similar to Harris County but less urban. There have been many developments in the style of country estates. Those are one to ten acre estates primarily for a horse and livestock spacious style of living. There are of course a number of planned communities, but I have yet to see even one come up to the standards of The Woodlands. This type of expansion results in lower population areas and a different means of commercialization of the area. For example, the dominant trend has been to commercialize along major highways in any way possible. That strategy of commercialization is what occurred in Harris county, especially along FM 1960. Haphazard development has been the rule throughout Texas except in master planned communities. Housing development near FM 1960 was accomplished with small development areas, without zoning or rules to protect the environment or resources, nor through a plan of capacity for businesses for the population growth, not interconnecting pathways or any sort of master plan. This problem has not been solved on FM 1960, as one will see when going to Atascocita, which has huge traffic problems and is beginning to suffer the same problem as the western area of 1960. There is no master plan. 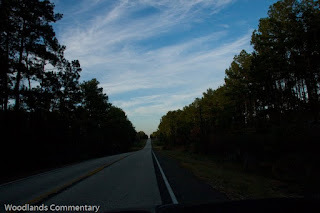 Coming back to Montgomery County and the areas near The Woodlands - we watch highway 105, Kuykendahl and FM 2978 develop in a "whatever domino falls, let it fall" fashion, a mix mash of "who knows how it will come out? - let the market and private enterprise drive the results" strategy, or "let the developers have at it" strategy. This is Texas style. Now let's take a step back and ask ourselves, do we really want this to happen? Our children and grandchildren may actually want to live here after we are gone! Today FM1960 west of I-45 is full of crime and ugliness. Can't we have a county we can be proud of? Not cheap strip malls, not cleared land with big signs and trash in view of the road frontage? The Woodlands is a shining star of Texas and has a great reputation nationally, but that will not last if it is surrounded by a random domino falling development game strategies. To quickly zoom in on the particular subject of this article, let's skip any more background and get into the discussion with the judge. 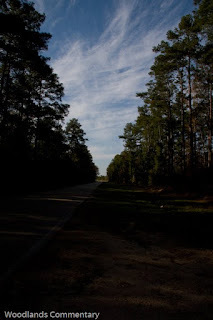 He and I have a mutual interest in the future of this county and mutual admiration and respect for the tall pines and large hardwoods of the county. After all, 100 years ago 90% of the county was forest! In fact, as late as 1990, 75% of the land in Montgomery County was forested! One has to take a step at a time to reach out in order to mold some potential from our remaining lands, but we need an enabling process to occur to do much about it. Judge Sadler believes there is an opportunity in west county to develop another community, larger than The Woodlands, that could have the same type of "livability" standards and values. That is, carve an urban area out of the remaining forest there for future generations and preserve the large trees and the roadside views of today. Is this feasible? I asked the judge if mobility could support this. My take on it is that the new outer toll road will provide sufficient access to the area if the amenities were the same or better than The Woodlands. His view is that the highways in that area have excellent tall tree stands lining the roads and is almost ready-made for development. I think the photo of FM 1486 above substantiates his view. The opportunity is there for a master planned community. The highways have the right-of-way for double lanes in each direction and possibly even an additional middle turning lane. 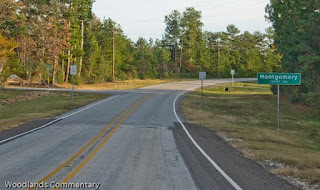 FM 1486 has very few turns. FM 1486 and FM 1774 provide north/south routes into the area. FM 2819 and FM 105 provide east/west mobility routes. The area is north of the urban non-incorporated area of Dacus. 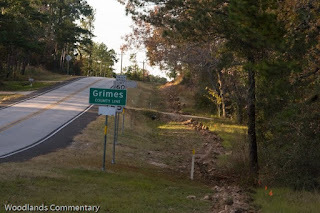 I will publish a separate article on that little town and a nearby interesting place in Grimes County. There is the potential to have another double-county master development in a similar context to The Woodlands, because there are landowners in Grimes County with large acreage of timber adjoining those timbered blocks of land in Montgomery. As Judge Sadler expressed it, the opportunity results from "old logging timberland sold by George Mitchell to about five landowners". Looking at the areal photographs, it is easy to see the patterns of planted trees for lumber production. Since the time The Woodlands was first acquired and planned, and since the time the new development company took the job of completing the project, there has been a tremendous amount learned in developing living areas using principals of "livability" to a resource conscious world. A new "Woodlands" would have the opportunity to leverage that knowledge and modernize a vision to fit the modern world. We are proud of what we have here in The Woodlands, but there is so much more that can be done to improve the master plan model. I'll save that for a future article. In the Grimes area, there are hills which would provide more of an athletic challenge than does The Woodlands for running and biking. These also provide opportunities for deeper lakes. Although a long way from Houston, there is pent up demand for urban areas away from the big city, as The Woodlands has demonstrated. What obstacles are there? Most of the issues rests with the Texas legislature. Counties have little authority. The job of the County Judge and his Commissioners is to maintain and expand county roads to access developments, towns and cities. Incorporated areas have zoning authority. With incorporated areas only having 20% of the county population and the county governments not having any authority for zoning, nor having capability to preserve natural resources, the state has to do it. And does the state of Texas take natural resource control seriously? It does not regulate the cutting of trees. That leaves the decision of resource purely to land owners. In the past, some of them have been quite diligent in preserving the forest, but those owners are getting to be fewer and new owners are more commercially inclined. Therefore, our trees do not stand much of a chance. They in fact will not stand but fall, just as we have observed over time. History will be repeated unless we do something about it. Texas can and should continue to be a great state, but it is decaying rapidly with uncontrolled growth, with essentially no governed presentation of structures on private property. The state is not what it once was and holds no real promise for the future unless we do something about it. As the judge said, "we need deep pocketed developers to come in to preserve our trees. Conroe's influence has increased the preservation of our trees by annexation and zoning regulations, but that only affects 20% of the population of the county. I have been seeking the preservation of our trees for many years." The feasibility of such a project depends on several things, but mostly on there being a consortium of developers with sufficient financial resources and will to plan and develop a second "Woodlands". That and time are required to make this happen. Land owners will be willing to sell only in time. There has to be a commercial interest in negotiating and acquiring these lands as they become available. On a broader scale, Texas must come to terms with the issue of protecting its related resources - i.e., trees and water. High growth areas need to be regulated.